This year’s uncirculated American Gold Eagle from the West Point Mint moved faster out of the sales gate than past issues. 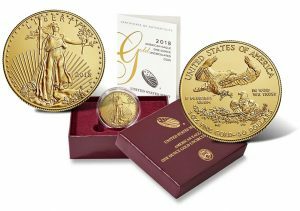 U.S. Mint sales figures published today show collectors grabbed 4,149 of the coins in the four days since its Thursday release. That more than doubles last year’s debut, and ranks at the top of the pack against other recent starts. Earlier today, the U.S. Mint reduced pricing on its gold coins. The uncirculated Gold Eagle went down $50 to $1,540 from $1,590. The U.S. Mint published sales data for 164 numismatic products. Forty-five of them outperformed their prior weekly gains against 43 previously. Not counting the new uncirculated Gold Eagle so as to compare apples-to-apples, 5 products increased by more than 1,000 units compared to 4 previously. In addition, 7 products saw their sales totals reduced against 6 in the previous report. Several Voyageur quarter and coin products saw drops ranging from 29 to 482. Below are tables showing the latest sales for U.S. Mint numismatic products. The sales period covers from July 9 to 15. Products with an asterisk (*) are no longer available or had no reported sales. How can the WWI medal sets show an increase. I thought they had to be pre ordered and were minted to that number? Anyone considering this set? Wish there was more info. Hefty fee for bundling when you can bundle yourself.